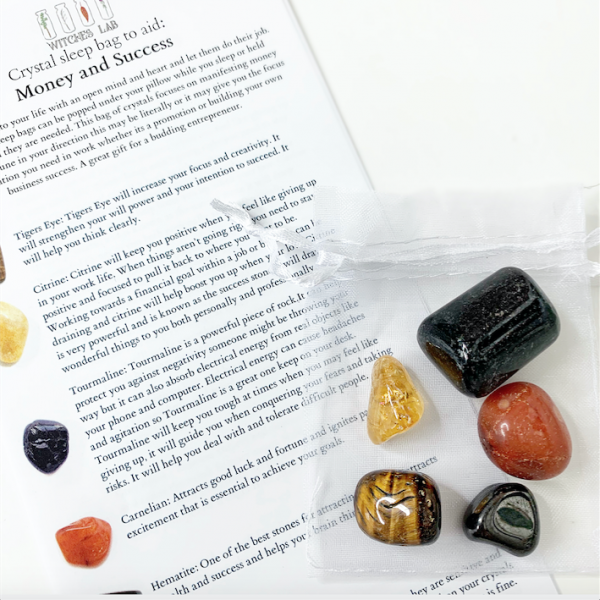 This bag of crystals focuses on manifesting money and good fortune in your direction this may be literally or it may give you the focus and motivation you in work whether its a promotion or building your own business success. A great gift for a budding entrepreneur. Citrine: Citrine will keep you positive when you feel like giving up in your work life. When things aren’t going right you need to stay positive and focused to pull it back to where you want to be. Working towards a financial goal within a job or business can be draining and citrine will help boost you up when your low. Citrine is very powerful and is known as the success stone it will draw wonderful things to you both personally and professionally. Tourmaline: Tourmaline is a powerful piece of rock.It can help protect you against negativity someone might be throwing your way but it can also absorb electrical energy from real objects like your phone and computer. Electrical energy can cause headaches and agitation so Tourmaline is a great one keep on your desk. Tourmaline will keep you tough at times when you may feel like giving up, it will guide you when conquering your fears and taking risks. It will help you deal with and tolerate difficult people. Tigers Eye: Tigers Eye will increase your focus and creativity. It will strengthen your will power and your intention to succeed. It will help you think clearly. Carnelian: Attracts good luck and fortune and ignites passion and excitement that is essential to achieve your goals. Hematite: One of the best stones for attracting money. It attracts wealth and success and helps your brain think logically. Cleansing and charging your crystals: I have cleansed and charged these crystals myself however they are sensitive and can pick up energies along their journey to you so I recommend when your crystals arrive you can soak them in salt water for 1-24 hours (please do not do this with the Hematite) whenever you feel like your crystals could have picked up or absorbed any negative energies repeat this step again. You can also supercharge your crystals under a full moon by placing them in the moonlight just after sunset ( I will touch more on this in my blog but please feel free to research this online you will find endless information if you are a new crystal owner) Your crystals are yours they will work with your energy and you will feel connected and loving towards your crystals.